On December 11, 2017, Organic Plant Care, LLC earned Accreditation from the Tree Care Industry Association (TCIA). At this time there are only 7 other Accredited companies in New Jersey, and just over 450 in the whole country. Being part of this elite group of professional tree care companies is both an honor and an ongoing responsibility (it requires periodic recertification to ensure that all criteria are continuously met). Getting here took a lot of hard work and we’re proud of everyone on the OPC team who gave their best to make it happen. Why Hire a TCIA Accredited Tree Service Company? 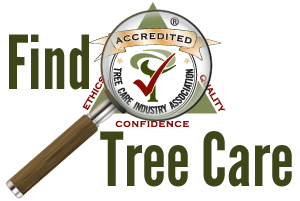 TCIA Accredited companies are the source for expert, professional tree service. Look for TCIA’s Accreditation logo to ensure you’re getting the best service possible if you’re a homeowner searching for quality tree service in your area. Many homeowners research tree services on Angie’s List, the Better Business Bureau (BBB), and Yelp before signing a contract. Check out the chart below to learn how thorough the TCIA Accreditation program is, and why it’s recognized as the gold standard in the tree care industry. Choosing an Accredited company provides far more protection for you so you can be comfortable knowing that the company you hire will do the job properly and safely.